Vanguard Gallery is delighted to announce Xiao Jiang’s solo exhibition, Right in Sight, is opening on June 9th, 2018. In this exhibition, Xiao Jiang continued his artistic practice by collecting materials from his daily life and recreating the images on canvas based on photos. 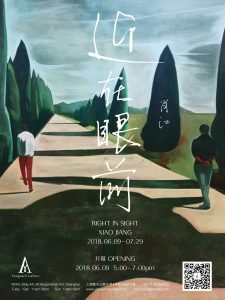 From screenshots of movies in his earlier artistic career to mundane things, from sights he sees to a moment of a lovely gathering with friends, from indoor to outdoor sceneries —- all such themes that Xiao depicted are extends of his own life experience. As we look back to Xiao Jiang’s artist career for the past decade, photos he casually documented his life with had provided him not only with memories but also the initial materials and emotions for his paintings. Yet both the subject matters and the emotions are gradually detached from the original images. Along with Xiao’s further artistic exploration, his paintings are integrated with imaginary elements and are becoming creations independent of the photos. The artist has developed an increasing focus on painting itself through such process. In terms of coloration, Xiao Jiang has adopted the most basic and well-known complementary colors, red and green, to construct his canvas. With deliberate considerations of light and shadows, he has found a series of subtle shades of red and green, which created a harmony with calmness despite the high contrast between the two complementary colors. All subject matters are abstracted into geometric color blocks. With a few bright strokes contouring out the image, the paintings have carried on his artistic language, which characterizes his individual style in painting all along. Compare to his past works, these paintings have employed relatively bold compositions. From a unique perspective, the artist reframed and reconstructed these pictures with slightly tilted compositions, shifted centers and cropped figures. Yet there appears a subtle balance in these images. Now, these paintings have nothing to do with life experiences nor personal memories, reality nor imagination. —- They are only about painting. With Xiao Jiang’s large scale paintings settled in the limited gallery space, viewers are situated in an immersive environment of his works, where every stroke, every sense of emotion and the artist’s sincerity are all right in sight. Born in Jinggangshan in 1977, Xiao Jiang graduated from China Academy of Art with an oil painting major in 2003. Recent exhibitions including: MOUTAINS, MOCUBE, Beijing (2017); Decoherence, ShangART, Shanghai (2017); Warehouse Story IV, Vanguard Gallery, Shanghai (2016); PARK, BIG SPACE,Shanghai (2015); The Park, Thousand Plrteaus Art Space, Chengdu (2015); IVY ART 2015 · Chinese Young Artists Annual Exhibition, Today Art Museum, Beijing (2015); Warehouse Story V, Vanguard Gallery, Shanghai (2015); Illusory Realness and Truth, Galerie Huit, Hong Kong, China (2015); Resolution, SVA-NYC Art Platform, Shanghai (2015).